Today I'm going to talk about coffins. Not real ones, but the ones that are clearly marketing devices aimed at me personally. There's something about a nice coffin-shaped box that assures you that whatever's inside is serious business. 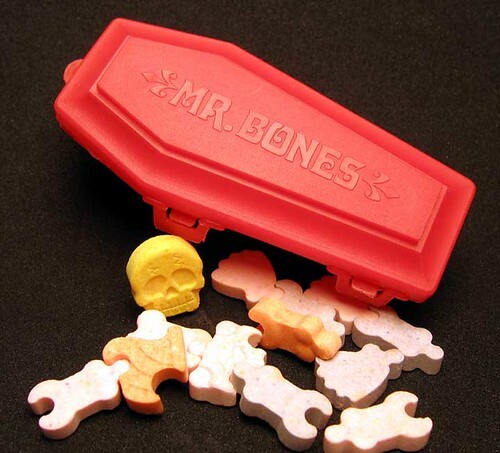 From the first time I popped open a coffin of Mr. Bones and halfheartedly tried to assemble the candy skeleton inside before giving in and consuming it, I knew coffins were really just Halloween's version of treasure chests. Recently I have come into possession of some great coffin-borne goodies that do serious justice to that legacy. So, without further ado, let's look at some of the wonderful coffins I have acquired recently. First up is this fine Hexbug Nano Mutant Zombie that I picked up in clearance from Target after last Halloween. A Hexbug Nano is basically a glorified toothbrush robot that vibrates and moves forward really fast because it has a lot of little rubber "legs" that only point in one direction. Already cool, but the Mutant Zombie version has a glow-in-the dark skeleton on top of it, and if that's not enough, it comes in a coffin it is absolutely bursting out of. Look at those busted planks: It's coming for you! 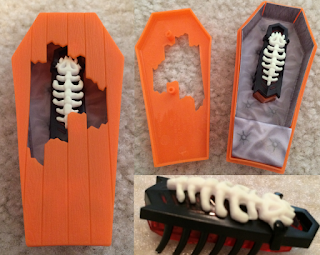 And one last note about this: like all the other things I will be reviewing later, there's serious thought into making sure the coffin is re-usable rather than disposable, with plastic inserts to hold the Hexbug in place pretty solidly. 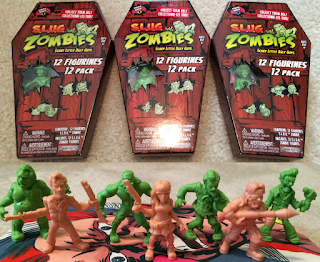 Next up are another Target clearance item from two years ago (thanks to a warning from my buddy John), SLUG Zombies 12 packs. 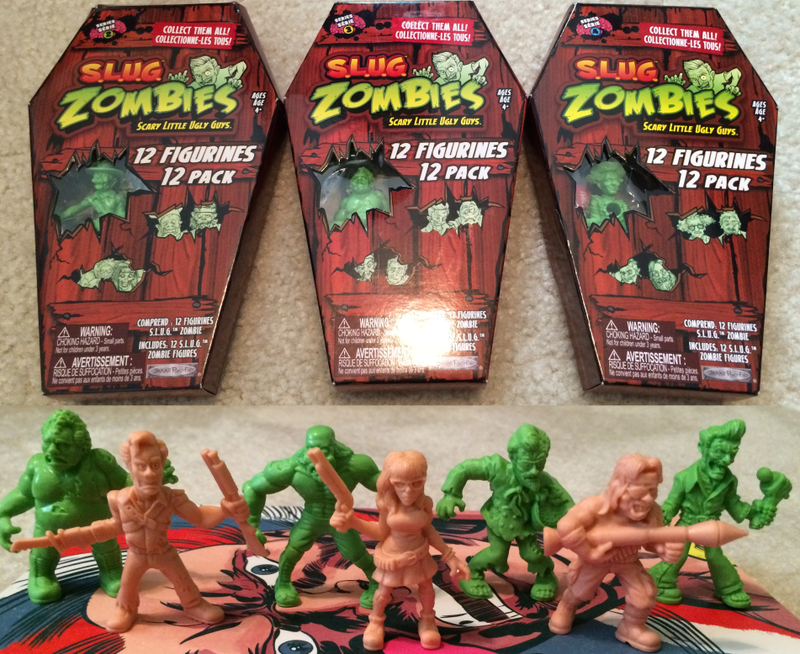 SLUG (short for Scary Little Ugly Guys) Zombies are very MUSCLE figure inspired, and consist of a ton of little green zombies and a few pink zombie hunters based on various stereotypes and pop culture figures. These boxes in particular contain Andre the Giant, Hulk Hogan, a one-eyed Rambo, and even a version of Velma from Scooby Doo you may have seen on a Threadless T-shirt. Again, the boxes are well designed to be re-usable despite being cardboard, even though they open across the back (although I wouldn't trust the cardboard tabs that hold them shut to last forever, and finding out how to jigsaw all the figures into the specially molded plastic case is probably impossible once you take them out). You can see I have the coffins for series 2-4, but as far as I can tell, they didn't make one for series 1 (although apparently series 1 had coffin shaped single figure blind boxes). 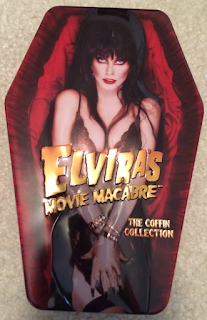 Elvira's Movie Macabre: the Coffin Collection is just a tin in a coffin shape, but it does look nice on the shelf and it comes with a stack of DVDs containing 13 DVDs with 26 classic films hosted by Elvira (including Manos: The Hands of Fate). And last but not least are these great decks of cards I grabbed at Disneyland last Thanksgiving. Not only are the boxes great, but they have a magnetic close and even a fake silk-lined interior for that real coffin feel. The decks are pretty solid sets of cards for the Haunted Mansion and Nightmare Before Christmas, two of my favorite things. 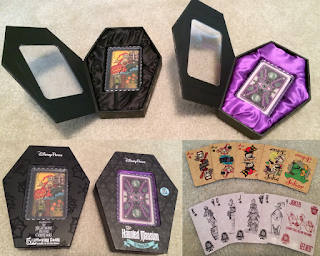 The cards for the Haunted Mansion glow in the dark, of course. Well that's all the coffin-related goodness I've got for now, but there will be more someday. And hopefully some smart company will bring back Mr. Bones! I need a lot of Dracula toys.